The triceps brachii is the muscle that runs down the back of the humerus, which is the long bone of the upper arm, and ends at the top of the ulna, which is the long bone of the forearm. Origin of Long Head: Infraglenoid tubercle of the scapula. Origin of Lateral Head: Lateral and posterior surfaces of the humerus above the radial groove and lateral intermuscular septum. Origin of Medial Head: Posterior surfaces of the humerus below the radial groove and from the medial intermuscular septum. Posterior surface of the olecranon process of the ulna , capsule of the elbow joint and antebrachial fascia. All the three heads of triceps brachii are innervated by the four branches of radial nerve (C7,C8). However according to the cadaveric study it is found that the medial head of triceps brachii is innervated by the ulnar nerve.. 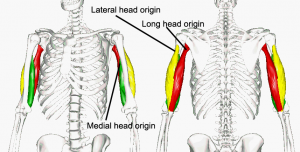 Some research reveals that the long head of triceps is actually innervated by axillary nerve. The muscle is supplied with oxygen and nutrients from the branches of deep brachial artery. 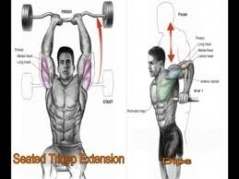 It helps in extension of the elbow joint and also act as an antagonist of the biceps and brachialis. The triceps brachii also helps to stabilize the shoulder by keeping the head of the humerus in its correct position in the shoulder joint. Muscle histology and average innervation ratios estimated from absolute mononeurons (MN) counts showed that the medial head was predominantly formed by small type I fibers and motor units (69 fibers/MN). In contrast, the lateral fascicle comprised a great quantity of large type IIb fibers and motor units (179 fibers/MN), whereas the long head consisted of a more balanced mixture of fiber types and motor units (99 fibers/MN).Therefore the lateral head is used for movements requiring occasional high-intensity force, while the medial head enables more precise, low-force movements. When the shoulder is internally rotated, the ability of the long head of the triceps brachii to extend and adduct the shoulder is diminished. 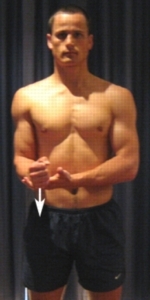 The shoulder must be externally rotated in order for the long head of the triceps brachii to assist shoulder adduction. ↑ Bekler H, Wolfe VM, Rosenwasser MP. A cadaveric study of ulnar nerve innervation of the medial head of triceps brachii. Clinical orthopaedics and related research. 2009 Jan 1;467(1):235-8. ↑ Lucas‐Osma AM, Collazos‐Castro JE. Compartmentalization in the triceps brachii motoneuron nucleus and its relation to muscle architecture. Journal of Comparative Neurology. 2009 Sep 20;516(3):226-39.